I LOVE fruit for snacks and when I read about SunRype and their products I got super excited. As my husband and I are active and very spontaneous at times it happens way too often that we run out of the house before even thinking of preparing a meal to go or have a snack before we leave. We absolutely love being able to have healthy and nutritious snacks easy to grab and go. SunRype’s products seemed like one of those things we would love to have around. SunRype happened to be very generous and sent me a bunch of their products to try. 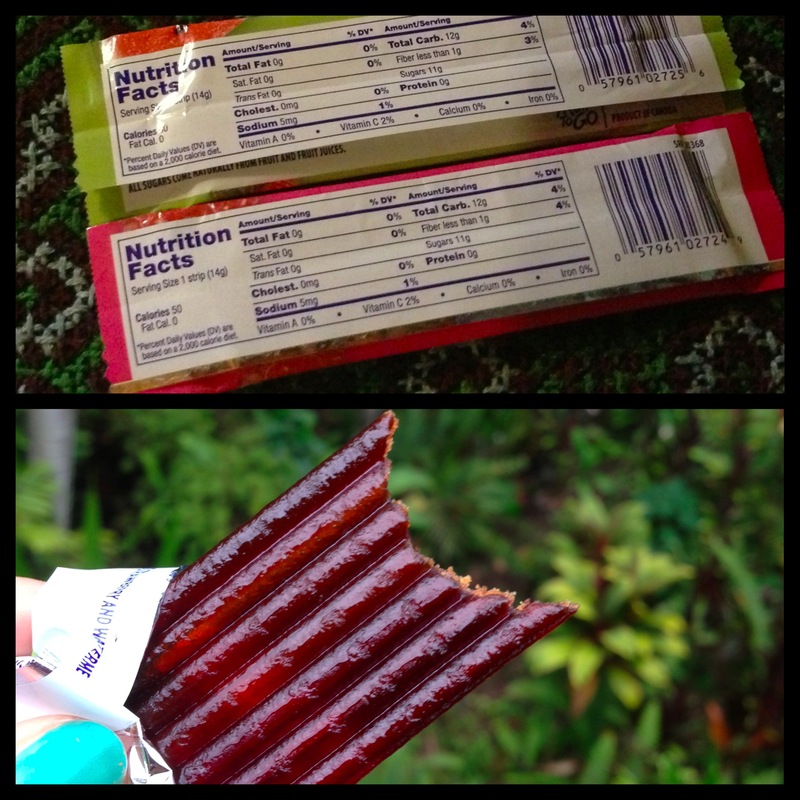 I received the product 100% Fruit Strips in two different flavors and FruitSource in the flavor Mango Mangosteen. Just seeing mangosteen being used made me jump of joy – I LOVE mangosteen but hardly ever find it except for when traveling. Actually the last time I had it before trying the FruitSource was during a three day jungle trek in Sumatra, Indonesia (it was pure luxury to sit down in the jungle, watch orangutans and eat fresh mangosteen). I’ve mentioned before that I am all in when it comes to natural products and try to really stick to eating things that are good for me, not just tasty. 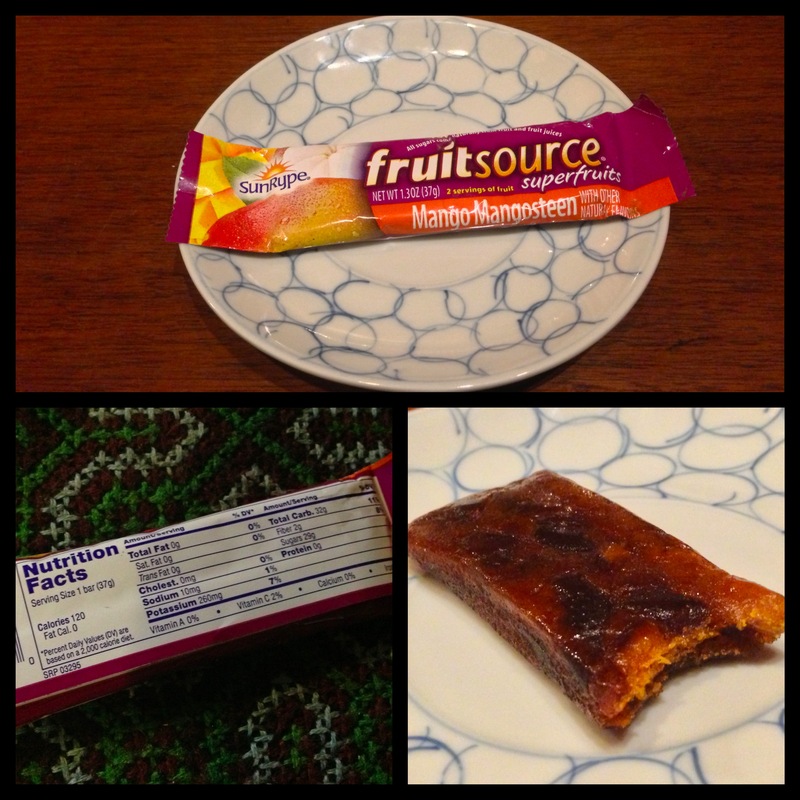 These 100% Fruit Strips and the FruitSource “bars” turned out to be a BIG hit! They are not just tasty but also provides the qualities I’m looking for when it comes to snacks/food in general. That is: they contain no added color, no artificial flavors and no added sugar that isn’t coming from fruit! 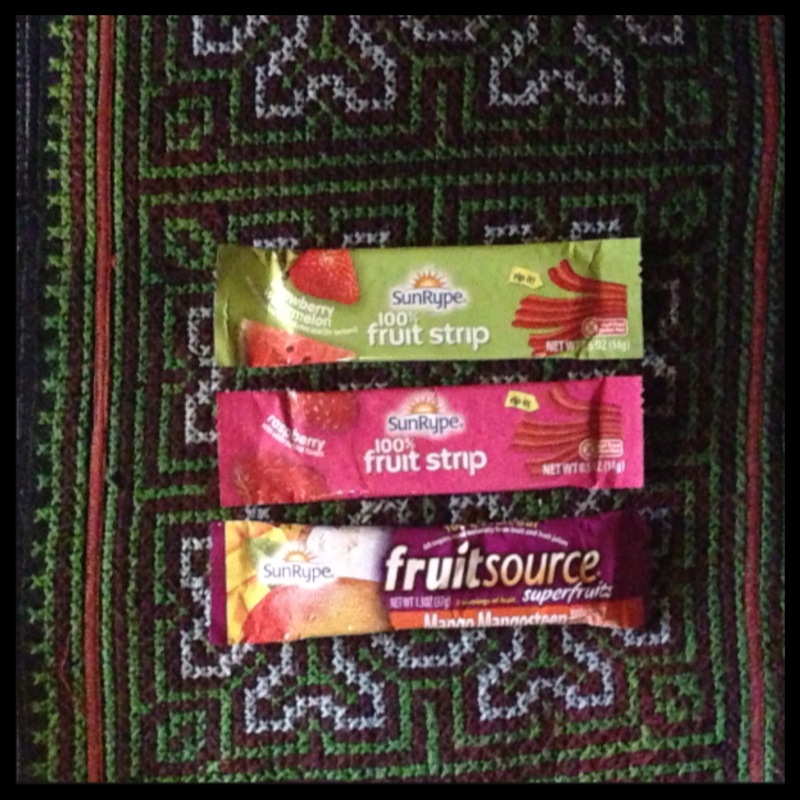 The flavors of the 100% Fruit Strips I got were Strawberry/Watermelon and Raspberry and are both new products. And they are both absolutely great! The texture is perfect, they are not too sweet and most important of all – they taste like REAL fruits/berries! My favorite was the Strawberry Watermelon, which I just couldn’t get enough off and I actually got really grumpy when my husband got the last one.. Sometimes my precious food becomes a little bit too precious maybe? Poor husband! But he really enjoyed these strips too, so I really was happy to share. At least some of it..
Then there was my favorite of the three different products/flavors, as you might have figured out from my mangosteen story above.. The Mango Mangosteen FruitSource bar! This bar is sweet, tastes a lot and is filling me up enough to be ready for a run, hike, swim etc. I liked this fruit bar so much I actually rushed to SafeWay to get more of them. They just hit the market and I love that they are easy to find (both the FruitSource and Fruit Strips) in stores. SunRype has a great selection of fruit snacks, such as the Fruit Strips, FruitSource and Just Fruit & Grains which all come in a variety of flavors. One thing I haven’t tried yet, but love to see, is that SunRype is providing some recipes including their products on their website. I love this idea and I am definitely planning on trying some of those recipes out in the future. How tasty doesn’t the “FruitSource Chocolate Truffle Energy Bites” sound? Yum! And with this I have found a tasty natural alternative for a fruit snack, which keeps me floating (and smiling) in between meals and/or while out and about! Keep an eye out for SunRypeUSA in your store. They are delicious! Oh! And another GREAT thing with these products is that my husband, who usually often both crave and buy candy now have replaced the (according to me pretty nasty) artificial gummies with SunRype 100% Fruit Strips. Got to love that! Q: Do you have a favorite fruit? Do you eat straight up fruits or do you like to mix it up with products like/similar to SunRypeUSA’s products? I was sent these products for free to try and review, however all above opinions are my own. Categories: Food, Reviews | Tags: Fruit, Fruit snack, Fruit Strips, Mango, Mangosteen, Review, Snacks, Strawberry, SunRype, SunRypeUSA, Watermelon | Permalink. 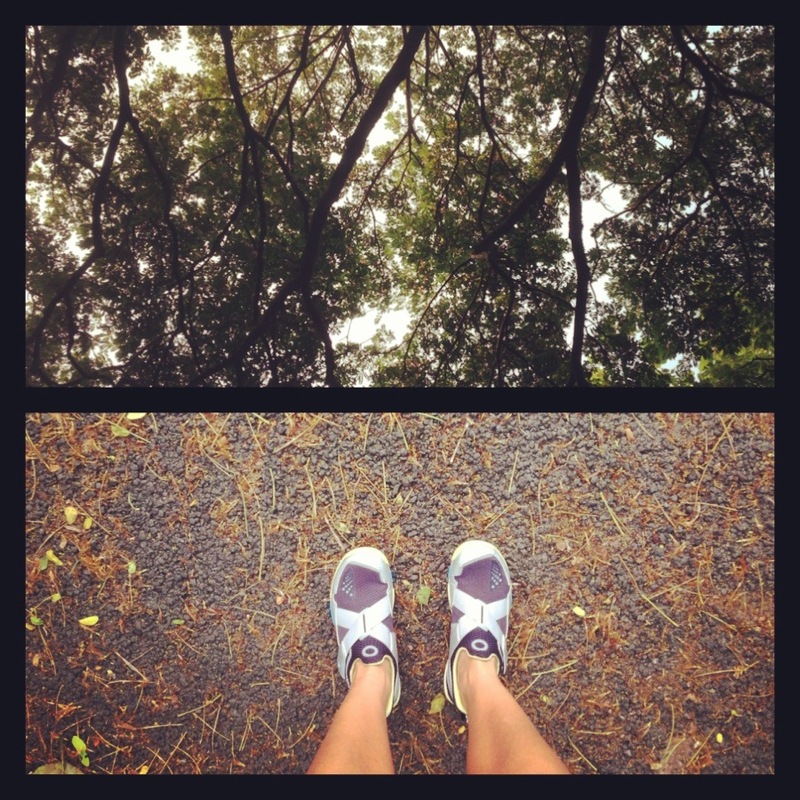 Life continues to be kind of in my way when it comes to my running (and the blog). It makes me feel semi depressed and frustrated. But at the same time, it fills me up with even more motivation to get out there and crush. Lately I’ve been really (and I mean REALLY) starting to crave a race or ten. I just want to get out there and go for it. I know I’d feel disappointed with my time if I did a race now (I’ve mentioned how much the injury put me back in earlier blogposts) but I just want to get all the way back, and training for and running a race is a great way to do it! My next race is in June. 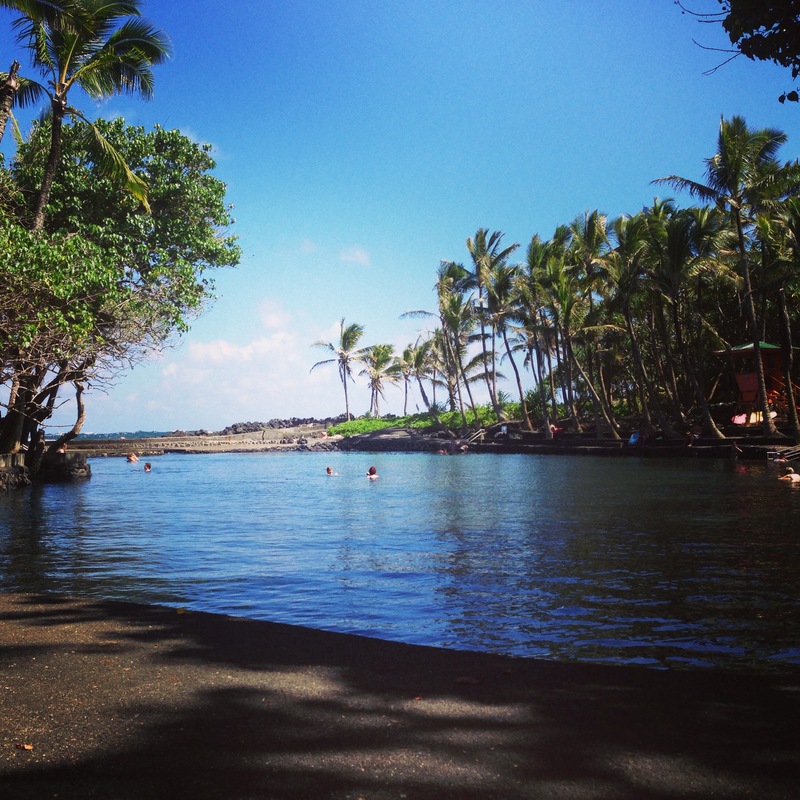 A 5k during the Kona Marathon weekend and I’m as excited about it as I’m scared of it. Until then I hope the things that have been going on in our life will stop being in the way of my running and my normal happy mood, so that I can get some good running going. I’m not expecting to be anywhere close to my 5k PR at that race but trust me, at coming races this year and next year I’m in it to completely CRUSH that 25:46! But for now, focusing on hopefully getting a good run in today. It will probably be a rainy run and I’m all good with that. I’ll let the rain wash my troubles and my frustration away! And hopefully stay cool enough to power through a semi long run. Categories: Life, Running | Tags: Races, Road running, Running | Permalink. 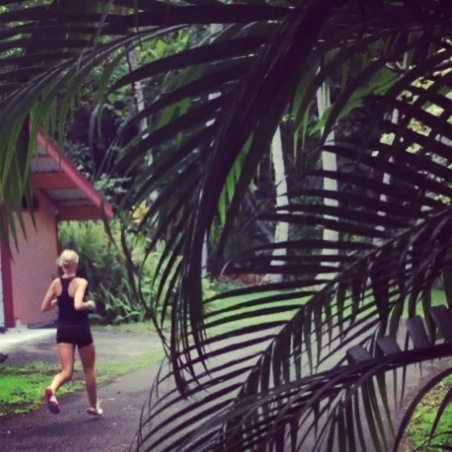 Running in heat, with PF without having a shower post run? Uhm, yes! We’ve had a lot of problems with the house we’re renting lately. The water pump caused a flooded basement and after that it can’t be trusted. So this means.. No water in the house. No water to do dishes, no water for flushing the toilet, no water to SHOWER. This is obviously my biggest problem, mostly because I’m a runner. And when I’m running I sweat. And by sweat I mean SWEAT. A lot. So running and not having a shower afterwards is not really an option, especially not since I have really sensitive skin and no shower and a lot of sweat gives me rashes. So yeah, life isn’t cooperating fully with my running lately. And honestly, I hate it. I wake up every morning wanting to move back home. Wait, what?! Leave “paradise” for a tiny apartment in Sweden?! I must be nuts! There is one solution (kind of) to the problem, I figured it out today: start and finish my run at the warm pond. My “pool” you know? I jumped into the water post run and even got myself a fresh cold shower before heading back home. Hurray! I have been training smart after I got back from the injury. But I made one huge mistake, I continued to run in my old Asics far too long. I noticed already before I got injured in January that my shoes were getting close to retirement. Small twitches in knees and so on had me thinking that it was time for a new pair of shoes. And then, enter injury and I completely forgot about this until the day I slowly started running again. I spent countless hours trying shoes on at Sports Authority and similar shops in Hilo (no specific running store to be found on this part of the island) and I just couldn’t find a shoe to buy. I knew I wanted to transition into a lower heel-to-toe drop shoe, a more minimal shoe, but I was stuck on the thought of finding one with 4-6mm drop and that turned out to be a hard nut to crack. 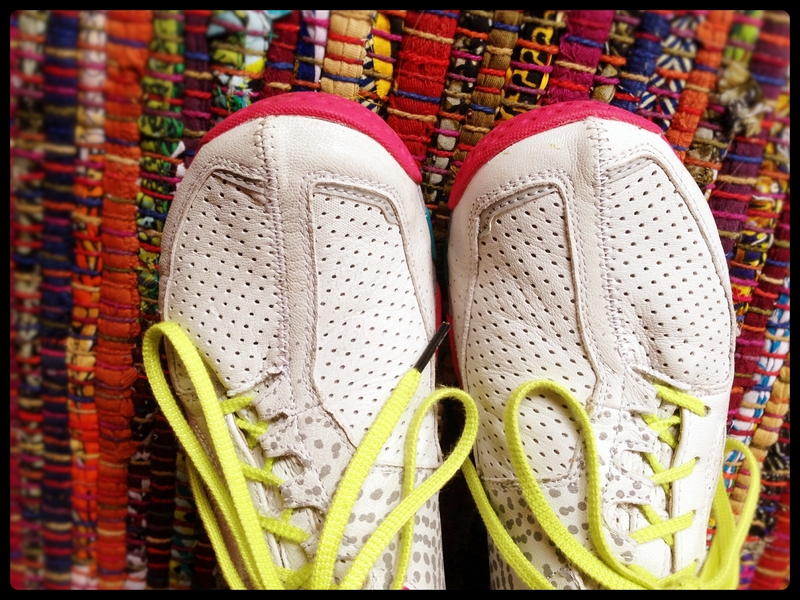 I tried the Saucony Kinvara 3, the Brooks PureFlow, the Nike Free.. But no, none of them were right. Finally, my answer turned out to be SKORA. Zero drop. Real running. I’ve transitioned into them pretty slowly but this means I’ve been spending way more time in those old Asics than I should’ve, which leads to the “my right foot” issue – I have Plantar Fasciitis symptoms and have had so for quite a while now. Yay, another injury?! No, not really. It’s really not that bad, but enough to make my running hurt every once in a while. I’ve still been running pretty much as normal, slowly adding miles per week and month but I can assure you I’ve spent a lot of time massaging, stretching icing, rolling and applying icy hot cream on that poor foot. I feel like I might have it under control and still feel hopeful I’ll be able to continue my training and progress as planned. I know, I shouldn’t be complaining about living in Hawaii. I really do love it! But darn, sometimes that heat and humidity really gets to me. I try to run in early AM (this doesn’t work out great right now because of the above mentioned right foot being extra grumpy in the AM) or just before sunset, but I still struggle. I hydrate well, I really do. And I think the best solution for this problem might actually be to surrender and give in to the need for a hat/visor? Or maybe you have any other solutions for me? Something I’m missing when it comes to running in heat? Anyways, this thing with getting a hat/visor.. Don’t tell me this is no big deal, because it is. I spent hours in Seattle going from store to store to try to find a hat that would fit my tiny female skull. It didn’t work, I really didn’t find a single hat that wasn’t too loose! But other than this, life is good. Really, I’m all good, staying positive. 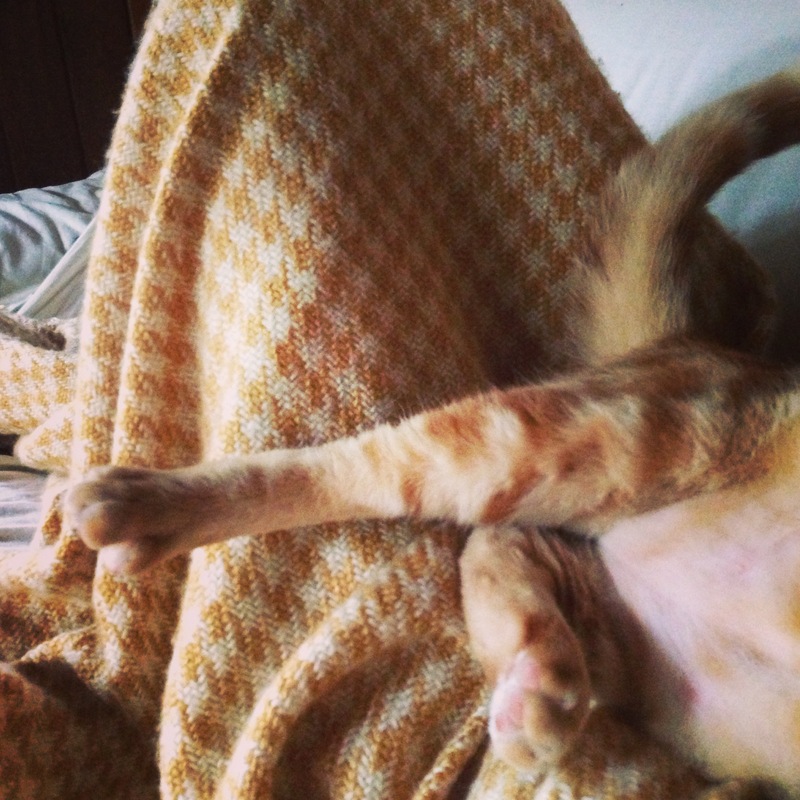 Smiling a lot and enjoying lots of cat cuddles and a swim in the ocean every once in a while. Q: Do you live somewhere where it gets hot, like too hot? How do you manage to cope with the heat while running? Any special tricks? Categories: Life, Running | Tags: Asics, Hawaii, Injury, PF, Plantar Fasciitis, Running, SKORA, SKORA Form, SKORA Running | Permalink. I’ve felt so good with my running lately! I’m still far from where I was in December/January (I PR’d in a 5k race December 30th – 25:46, which I’m pretty darn proud of since I had only been running for about 7 months at that time) but things are really moving forward. I know that I was supposed to take it easy coming back from my injury, but I think my fear of getting re-injured was holding me back. Was I taking it too easy? Pretty sure I did. When coach Mark from Teach To Run contacted me offering a month of help with my running I suddenly got that push I needed to move on. To stop fearing injury and actually push a little bit. I’m still concerned and trying to be smart with my running, but I feel like I’ve found that courage I needed to get back out there for real. That extra motivation and trust in myself, that I will get somewhere and that me getting somewhere, moving forward, with my running isn’t equal to me getting injured again. I ran 29 miles in April. This is about half of what I did monthly before the injury, and I could definitely be bummed about it, but I’m staying positive and thinking of the fact that I wasn’t able to run at all during January and most of February. As for May.. So far I’ve been running just over 19 miles and I know that the total for the month will be higher than April’s. Yay me! When it comes to pace I went from an average of 9:50 min/mile in December to probably a minute slower for the month of April (can’t seem to find my ANT+ stick for the Garmin hence no proper stats for the time being). It can only get better, and it will. Trust me. Speaking of my running lately.. I was sent the link to the article “Running On Air: Breathing Technique” posted on Runner’s World and it right away caught my interest. One of my fellow running tweeps heard I had been injured and before he knew what the injury was he wrote “Left side injury, right?” and yes, he was so right. He then sent me the link and I got his point. I’ve been incorporating this breathing technique (3 in, 2 out) and as I struggled a bit in the start the more I get used to it, the better I feel when running. I’m not getting as out of breath as I used to, not even when pushing harder. I know, this might be a total placebo, but since I started running I’ve had somewhat a problem with breathing comfortably and this sure helps. Q: Are you aware of your breathing when running? Do you use any kind of breathing technique when you’re running? Categories: Running | Tags: Breathing, Injury, Run, Runner's World, Running, Running on Air | Permalink. I haven’t been running for a very long time, still I really do feel like I am a runner, which is a pretty amazing feeling! Especially knowing who I was just a few years ago. It’s probably easy to tell that running means a lot to me? It really does. It is my medicine, my joy, my way of finding my own strengths and it is my number one hobby. A hobby which takes up a lot of time and energy – if I’m not running, I’m definitely talking or thinking about running. Googling running related things or just looking at/dreaming about some running gear/apparel..
After a brief interaction with one of my followers I realized that I could actually run a marathon. I mean, I’ve known that I could if I aimed for it and went for it, but he made me realize that all I really need to do is.. Register. It all starts there, right?! So with this new perspective I’ve started to set up goals for the future. Since I became a runner there is one thing, one dream, I keep coming back to.. And it is that I want to run a marathon with my dad. My dear dad. The man who inspired and motivated be to play and coach basketball. The man who YEARS later got me into running and with that gave me the greatest gift I’ve ever had – I now run, and through my running I have learned so much about myself, about the physical and mental strength I possess, and I’ve found ways to channel stress, anxiety etc. This marathon with my dad will happen, I just need to plan it with him. Are we doing it in Sweden? In the US? During winter or summer? The future will tell. But it will happen. Categories: Goals, Life, Race, Running | Tags: Marathon, Road running, Running, Sweden | Permalink. I’ve been thinking a lot about running clothes and gear in general during the last year and one thing I’ve noticed always gets my attention is material. I have this ongoing thing with natural materials in general, I love natural things (have a look at my toilet shelf and you’ll see nothing but natural stuff – different kinds of oils, baking soda, honey, lemon, sugar..) and tend to get super excited when I see companies going down that road. So was the case when I first found out about Tasc Performance. 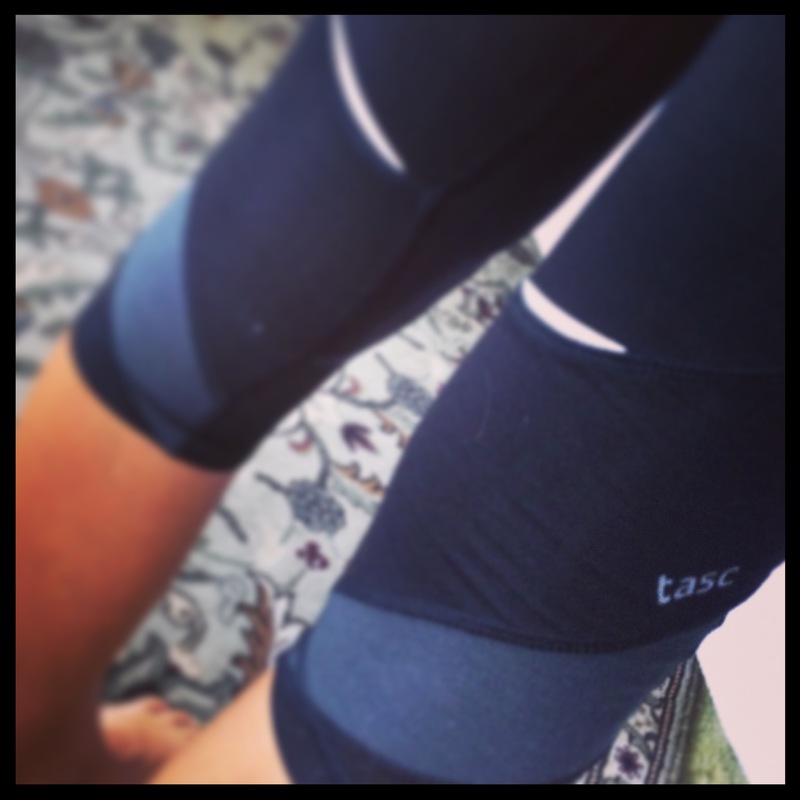 Tasc is using Bamboo Performance Technology which is made out of a blend of viscose from bamboo, elastane and organic cotton in their clothes. This makes for a natural alternative to polyester, that still gives you that comfort, moisture wicking and sun protection you want in apparel to stay comfortable and happy when working out. And, not to forget, it is also fast drying and prevents the clothes from getting smelly – I’m sure I’m not the only runner who really appreciates that quality when it comes to running apparel?! When I got in touch with the company they offered to send me some pieces to review and I gladly accepted. 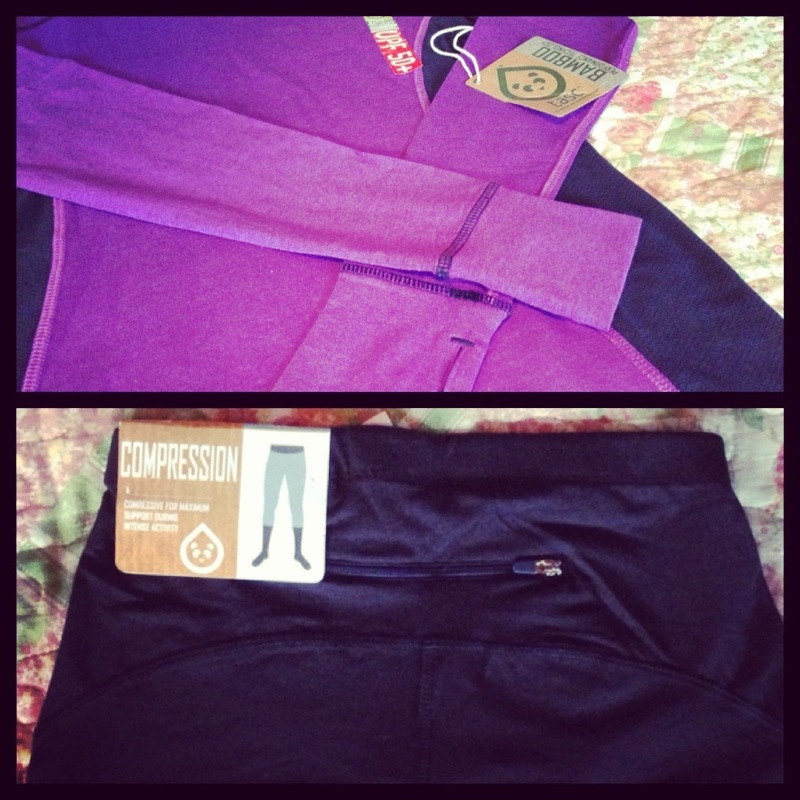 I received the “Performance Crop” and the “Motion Fitness LS” which right away got me excited. When first taking the clothes out of the package I felt the material and was really happy with how soft it was. I put the clothes on and literally did NOT want to take them off even though it wasn’t run o’clock and actually rather the opposite – time to sleep. 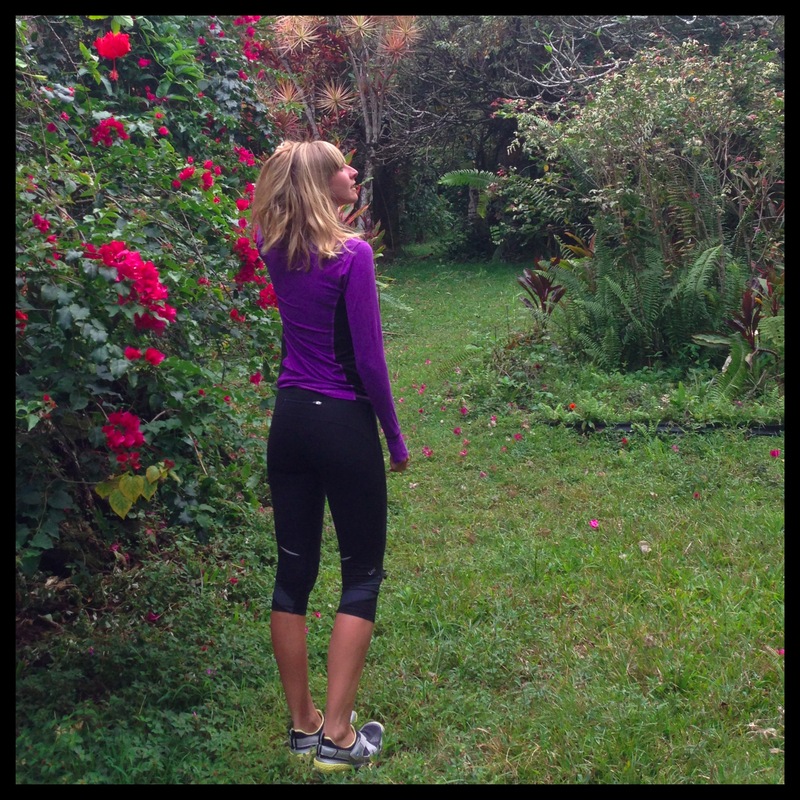 Once actually getting to run in the clothes I felt comfortable and happy. Love the details on the pants and the shirt – the color of the shirt with the flattering black FlowMesh inserts on the side, the gray FlowMesh fabric in the back of the knees and the big and actual useable (meaning: it fits more than a key!) pocket on the back of the pants. Not to mention the perfect thumb holes on the shirt! I’d be a very happy girl if ALL my long sleeved shirts had them. Love the feel/look of the pants and of course the thumb holes! Reflective details and gray FlowMesh behind the knees. I really like the cute Tasc Performance logo. Due to the moisture wicking and fast drying material I really found the apparel working good although I’m sometimes running in pretty high temperatures. This makes me really happy – natural apparel that will work in both cool and warm temperatures – definitely great qualities for what tasc Performance calls “the sport of life”! So, after trying these clothes out and really loving how they feel when working out or just lounging around at the house (or in town) I’m very intrigued by the brand and am actually already craving some of their new apparel. I’m especially curious about their Annecy Compression Short, the Vortex Short and the cute X-Cami top. Go ahead and check tasc Performance out on Facebook, follow them on Twitter or just cruise around on their website. 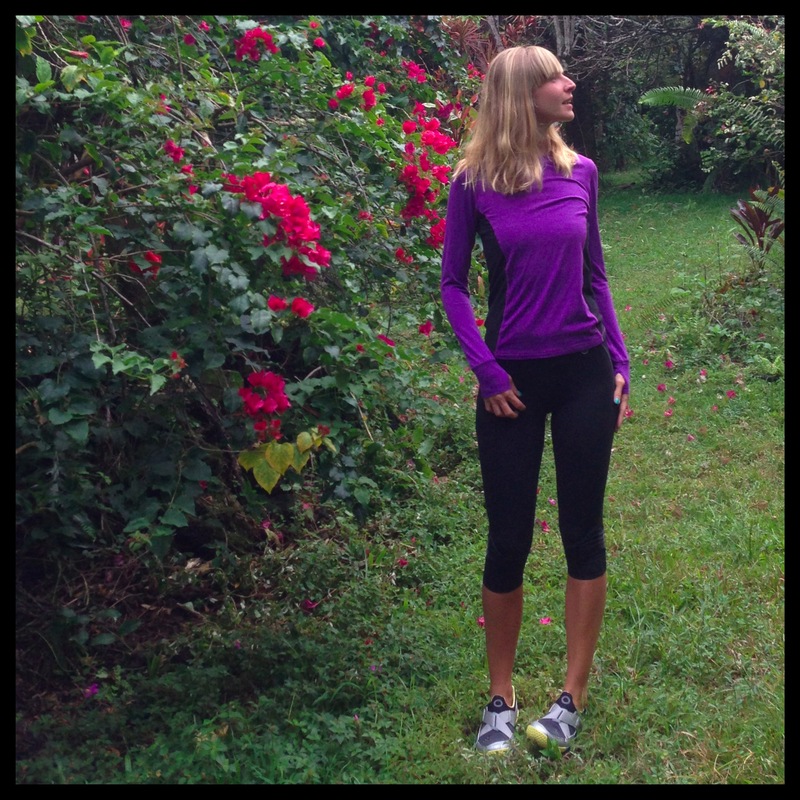 Categories: Gear, Reviews, Running | Tags: Bamboo, Organic cotton, Review, Run, Running, Running Apparel, Running Clothes, Tasc Performance | Permalink.